How is automation testing different from manual testing? Well, while manual testing involves a person in front of a computer, executing each test step, automation testing involves using a program or tool to perform the tests with no human intervention. 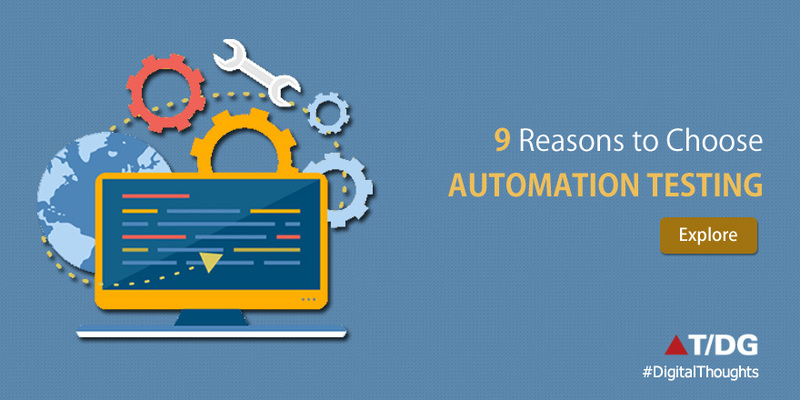 Automation testing comes with many benefits, besides making life easy for testers. With more and more companies prioritizing on quality, automation testing is fast becoming the solution to issues in software performance and unexpected delays in making the product ready for the market. So, what makes automation testing stand out? Here we shall look at reasons automation testing can redefine the approach to software testing. Perhaps the biggest benefit of automation testing is the fact that it brings about a substantial increase in testing efficiency. Testing of every software involves some complex and repetitive steps that can be very time consuming if done manually, thus reducing the overall efficiency of the testing process. Once the initial setup is in place, automation testing, on the other hand, can take a lot less time, thus increasing the efficiency. Also, the fact that automation testing can be run 24/7 can drastically affect the overall timeframe of the project, saving you time and money. Software testing can get monotonous at times, what with the testers required to perform the same set of steps over and over again. In such a scenario, there is a possibility of errors by even the most diligent testers (they are human after all!) Automation testing performs test steps precisely every time with no scope for errors and hence, is more reliable than manual testing for certain test cases. What’s more, automation testing tools record execution of test cases for further review. The fact that automation testing software is reusable makes it a rewarding investment, as the same testing tool can be used to test different versions of the software and can be upgraded as and when required to incorporate addition of new features and discovery of new bugs. Software testing can get repetitive and an automation testing tool can easily take care of the repetitive steps and at the same time eliminate the risk of human errors. Test coverage is one area where automation testing wins hands down, making it possible for execution of more number of tests for a particular software to improve the test coverage. With manual testing, this would require a huge team of resources working on it for enormous amount of time, which makes it quite impractical. However, the higher test coverage that can be achieved with automation testing leads to detailed testing with more depth and scope, which in turn adds to the quality of the product. Also, executing innumerable different complex test cases during test runs is possible only with automation testing, resulting in a level of test coverage that can seldom be achieved with manual testing. With the amount of redundancy involved in executing the same procedures again and again for different mock user environments, GUI testing requires mammoth efforts and can get immensely time-consuming with manual testing. An aspect unique to automation testing is that it can make General User Interface (GUI) testing incredibly easy through simulation of a typical user environment using mouse clicks and key strokes. A relatively high capital investment is what makes many think twice before going ahead with automation of their software testing process. However, the high initial investment is countered by a high return on investment (ROI) and this has been proven time and again. Automating your test process makes you save on money and time, which translates to a long-term ROI. Automation testing offers unmatched volume and simultaneity as the same test scripts with the same set of parameters can be run simultaneously on thousands of devices at the same time – a feat that’s impossible with manual testing. Learn more about how we can help you experience the many benefits of test automation with QARA Test, our Automation Testing tool for complete test management. To schedule a meeting or for more information, please write to us at info@qaratest.com.